I fell in love with the idea of an apple stack cake. In my mind’s eye it was tall and dramatic, yet rustic, with several layers of cake, fruit and glaze glistening and dripping off of the sides. The more research I did about stack cake led me to stories about a fairly austere sounding affair made with dried apples. My version is not an attempt at the classic, but rather a new creation that sprung to mind. 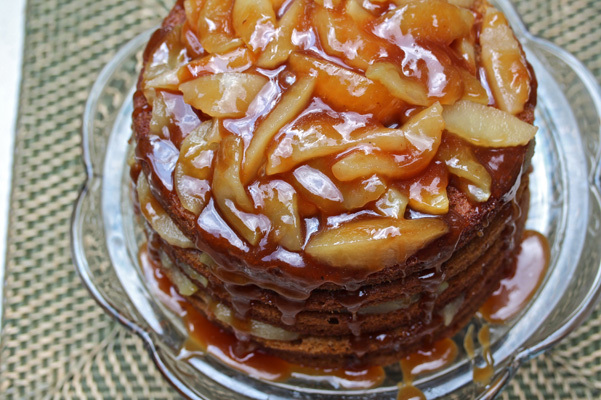 This one has six moist cake layers made with apple butter, buttermilk and spices, all interspersed and topped with caramelized apples and a drizzle of Caramel Apple Cider Sauce. 1 cup buttermilk, at room temperature. 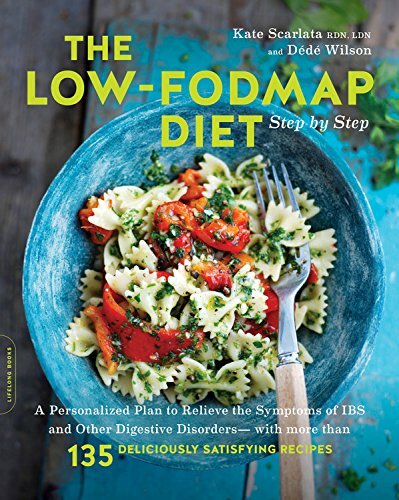 For the Apples: Combine the apples, sugar and lemon juice in a large and wide sauté pan. Sauté over medium heat until apples give off juice and sugar dissolves. Continue to cook, stirring occasionally with a folding motion, for about 20 minutes, or until fruit softens and juices begin to caramelize (see Tips). Cool before assembling cake. Refrigerate in airtight container up to 3 days. For the Cake: Position racks in upper and lower third of oven. Preheat oven to 350°F. Coat six 8-x 2-inch round disposable aluminum pans with nonstick spray, line bottoms with parchment rounds, then spray parchment; set aside. Whisk together flour, cinnamon, baking soda, ginger, cloves and salt in a large bowl to aerate and combine; set aside. In bowl of standing mixer, beat butter with flat paddle until creamy. Add sugar and brown sugar and beat until lightened and fluffy. Add eggs one at a time, beating well after each addition and scraping down sides of bowl as needed. Whisk together the apple butter and buttermilk and add this wet mixture alternately with the flour mixture beating just until combined. Divide batter evenly in pans (see Tips) and smooth tops with offset spatula. Bake for about 15 to 20 minutes or until a toothpick tests clean. The center of the cake will spring back when gently pressed. Cool pans on racks for 5 minutes. 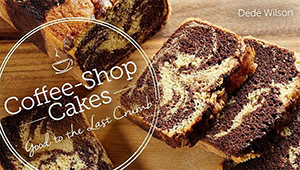 Unmold, peel off parchment, and place cakes directly on racks to cool completely. Trim layers to be level, if necessary. Layers are ready to fill and assemble. Alternatively, place layers on cardboards and double wrap in plastic wrap; store at room temperature if assembling within 24 hours. For the Filling and Assembly: Fill and assemble within 2 hours of serving. Have caramel sauce ready to use. Place one cake layer on display plate. Top with about ⅔ cup of the apples and any juice, going all the way to the edges. Drizzle with a little caramel (warmed if necessary). 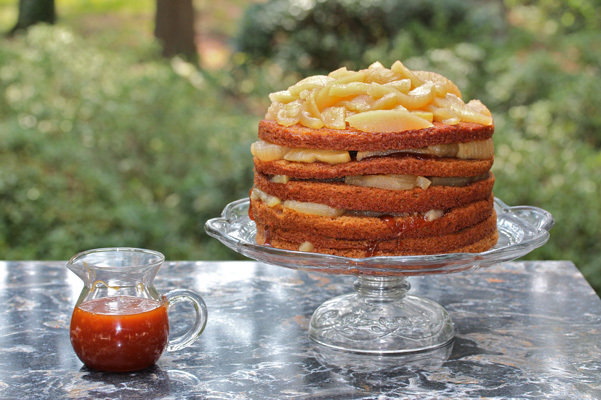 Top with second cake layer, apples and caramel and continue until you have placed last cake layer on top and cover with a mound of remaining apples. Stop at this point if you are holding cake for a few hours. Drizzle with Caramel Apple Cider Sauce right before serving. Believe it or not the slices stay upright when you slice them! I like to use a blend of sweet and tart apples. You could of course use one kind but using Granny Smith and one sweet apple is a great approach. You need a very wide sauté pan for the apples or the surface area won’t allow enough evaporation of the juices that exude from the fruit. If there is a lot of juice, remove fruit and reduce juice to a thick syrup. Re-combine fruit and syrup if necessary. I use a pan that is 12-inches across. One key factor in the look of this assembled cake is to make all of the cake layers even. You can pour the batter into the pans by eye, or you can place them on a digital scale and make sure each pan contains the exact same amount of batter, weight wise. 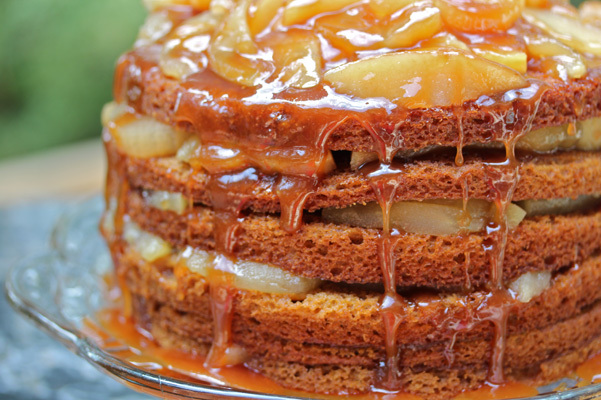 As the cake sits, the moisture from the apples and the caramel sink into the cake and make it taste even better texture wise, but it loses a little bit with its visual. Your choice how to handle this. I think the balance of drizzling with the Caramel Apple Cider Sauce right before serving gives it a fresh look, while having allowed the layers to meld.